This is French comfort food at its finest, Coq Au Vin (which translates to mean ‘rooster in wine’) was a peasant dish prepared hundreds of years ago. There is nothing expensive or pretentious about this dish. It looks as if it came directly from farm to table and if that isn’t enough to inspire, then imagine the wonderful aroma wafting through the house this Sunday afternoon when you prepare it. 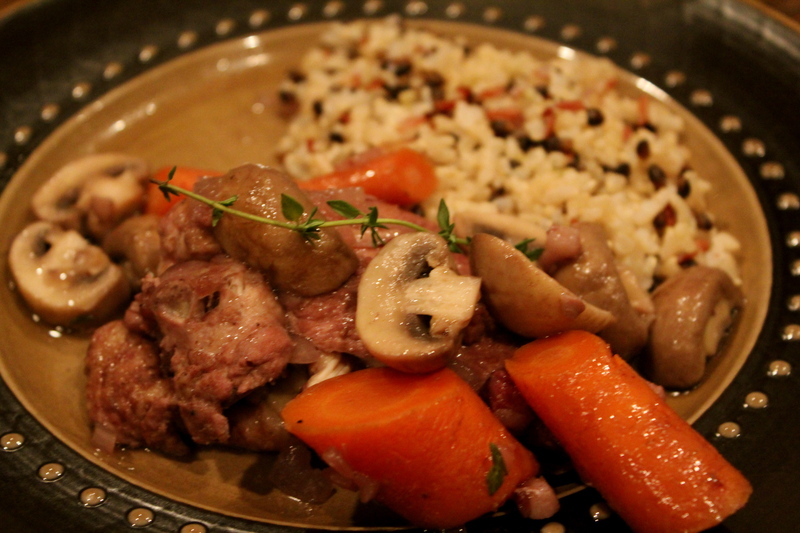 Serve it with crusty bread or a medley of rice (Trader Joe’s Rice Medley is pictured above). To make it even heartier, you could add some potatoes. For those of you who don’t care for mushrooms, never fear, they can easily be pushed off to the side…just like my husband practiced. They do impart an earthy flavor to this stew so don’t omit them entirely. I will go into more detail about the wine I used tomorrow, but keep in mind that any wine can be used in this recipe. Typically, the French have used a Burgundy, but Riesling is a popular wine used in this dish too. Whatever you like to drink will be the perfect wine to add to the recipe. This dish is not difficult to make, but it does need some…call it love and attention, call it stove time or call it babysitting, but keep in mind that you will need to set aside about 2 hours to prepare this fantasic meal. I put my kids to work chopping carrots and my youngest even helped me pour in the wine. Let me also say that she loved the chicken! I was so happy to hear her ask for more. My oldest tried it and did not care for it. Vive la difference. Preheat oven to 250 degrees. Add 2 Tablespoons olive to a Dutch oven. Over medium heat, stir in pancetta. Meanwhile, pat chicken dry with a paper towel and sprinkle generously with salt and pepper on each side. Allow to cook for about 10 minutes until lightly browned.Remove pancetta with a slotted spoon to a baking sheet. Cook chicken in batches for about 5 minutes, turning once halfway through so it browns on each side. Set browned pieces on baking sheet with pancetta. Add carrots, onions, 2 teaspoons salt and 1 teaspoon pepper to Dutch oven and cook until onions are soft, about 10 minutes. Add garlic and cook for another minute. Add the cognac and put pancetta and chicken pieces along with any juices that collected back into the pot. Stir in chicken stock, wine and thyme. Bring to a simmer. Cover pot with a tight-fitting lid and place in oven for 30-40 minutes, until chicken is no longer pink. Mash 1 Tb of butter with flour and add to pot, stirring carefully. In a separate saucepan add remaining 1 Tb butter and mushrooms. Cook under medium-low heat until mushrooms begin to brown, about 5-10 minutes. Add mushrooms to stew and simmer for another 10 minutes. Bon Appetit! Looks and sounds delicious! There goes my Cognac! Thanks Todd! I will admit that the wine can give the chicken a purplish hue which may not be optimal for photographic purposes, but man was it good!